Presented by the Trinity Laban Conservatoire of Music and Dance and The British Flute Society, with its ebullient Chairman Wissam Boustany as cheer-leader, this enterprising event featured memorable performances and revealing masterclasses, culminating in a recital at St Alfege's, Greenwich, by the acclaimed Dutch flautist and composer Wil Offermans, joined for several items by some of his students. Everyone there will have gained wider appreciation of the flute, as it has figured traditionally in Western concert life, and of its 20/21st C developments and contemporary potential. Anna Noakes with Gabrielle Dall'Olio gave a pleasant but scarcely innovative flute/harp recital, Alwyn & Liebermann, ending with a virtuosic duo in the idiom of Liszt's Hungarian rhapsodies by Franz Doppler. Emer Mcdonough's recital with Alex Szram piano was more satisfying, with sensitive accounts of Debussy's fragile Épigraphes Antiques which, for listeners who weren't very close, were compromised by the Old Royal Naval College Chapel's noisy heating system, which ought to have been switched off during the music. Karg-Elert's single-movement Sonata Appassionata was just that, a welcome novelty, and Prokofiev's Op 94 flute sonata drew you in and left one doubting whether it ought ever to have been taken over by the violinists. In their masterclasses, Emer McDonough worked on subtleties with the pupils on stage, but in so intimate a way that we in the audience could hear far too little; a difficult balance that needs to be struck for paying public masterclasses (N.B. John Henry due back next month in the annual Early Music Festival; q.v. "His fascinating comments, often abstruse and esoteric, were hard for the audience to hear; a headset radio mic would help"). Anna Noakes' class was inspiring; she helped 15 yr-old Laura Cioffi to sustain her tone in Cooke's cool and delightful Sonatina by working on "mouth shapes"; notably a round "o", with tongue depressed, to fill the lungs fully. She finishing by improving the already exciting Rosalind Ridout's interpretation of Frank Martin's Ballade - lessons for listening as well as for performing. 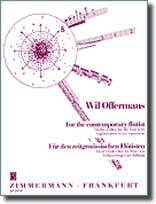 Wil Offerman's class was so revelatory that we abandoned a Wigmore Hall booking that evening for his recital of his music at St Alfege's, which was to include pieces he'd been teaching in the morning. A tremendous communicator, in body language as well as with words and demonstrations on his instruments, ranging from the one-hole Thumpy to the monstrous Contrabass flute. He concentrated on breathing and on extended flute techniques, helping Sarah Kohnke produce the range of "bamboo tones" for his Etude No.4 [L] and Helen Whittaker for Luna y Sierra which, at the concert, was assisted by a generous eight flute students supplying a drone accompaniment, rather akin to Indian classical music's tanpura ! 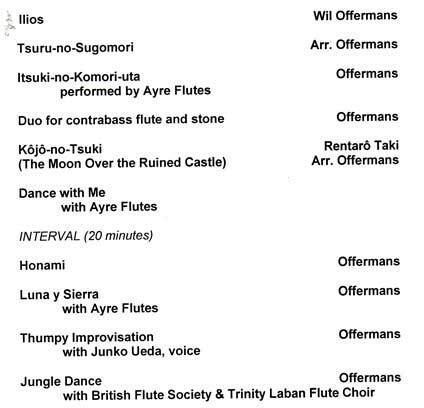 Of the solo compositions, most notable were Honami (previously heard from Wissam Boustany at St John's, Smith Square) and Ilios (1984), which is included in one of Offerman's several CDs. 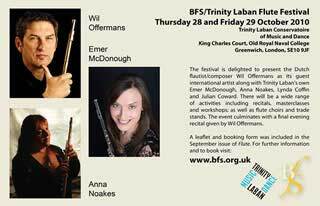 This concert was an altogether enthralling event, bringing to an end what, in a vote of thanks, Anna Noakes described as "the best flute course ever" ! 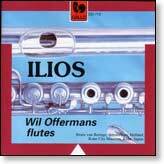 PS Wil Offermans new CD of his own compositions Luna y Sierra [CD-E131] draws upon his work at Greenwich and explores world music possibilities for the normal concert flute, including a transcription of Tsuro-no-Sugomori for shakuhachi. It includes tracks from the Greenwich weekend, some of which can also be enjoyed in video from YouTube [R].